We’re not going on holiday this summer – but I have booked plenty of days off work so that we can have some lovely days out. We started last week with three great days in the scorching weather that we’ve enjoyed for the last few weeks. On Saturday, Tony had to work, so it was just me and the girls. 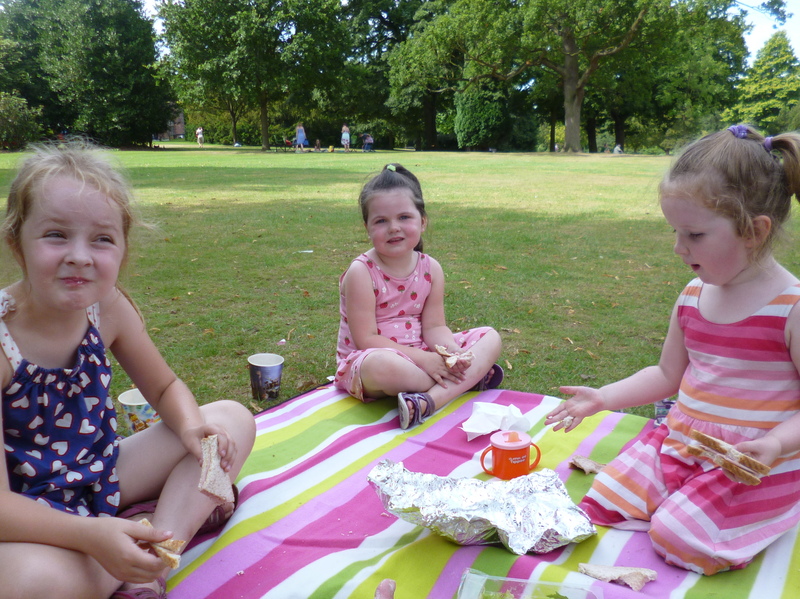 After carefully considering how ambitious I could be while flying solo in charge of all three, I decided to take them to Walton Hall Gardens in Warrington. 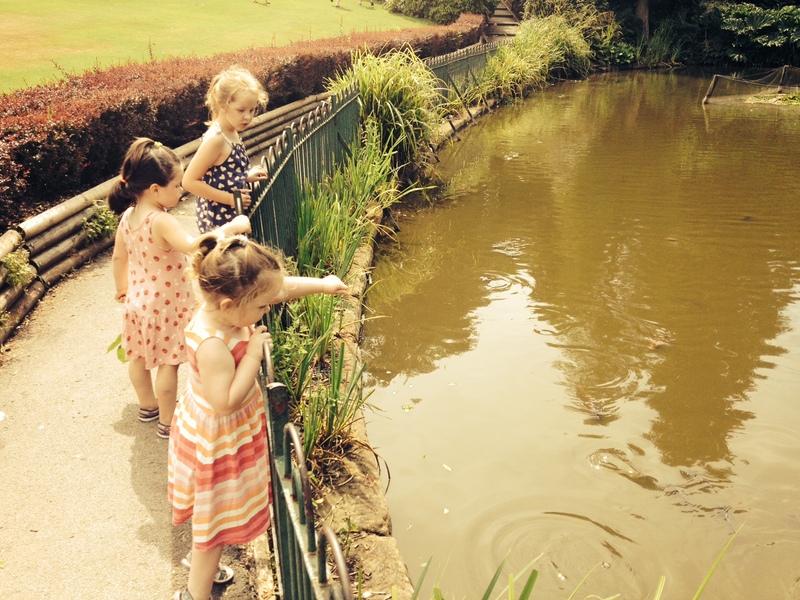 It’s great there – they have a huge playground with equipment suitable for all ages, lovely gardens with plenty of spots for picnics, a pond full of huge fish, a free children’s zoo with rabbits, birds, donkeys, pigs, goats etc. There’s a land train, and, in the holidays, there are trampolines, bouncy slides, and a pottery painting workshop, all at an extra cost of course (though it’s free to get in, apart from parking). 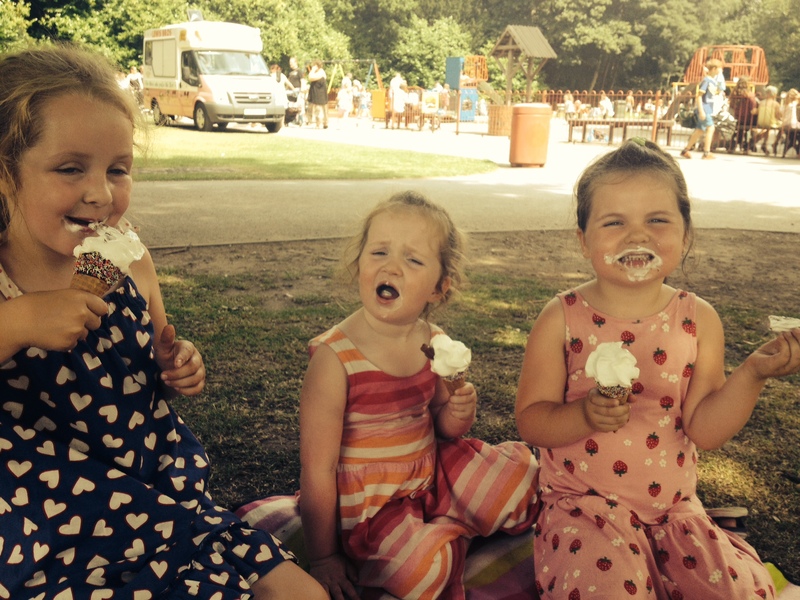 It took us forever to get out of the house – getting three children properly suncreamed takes a good 20 minutes! But once we were out we had a great time. 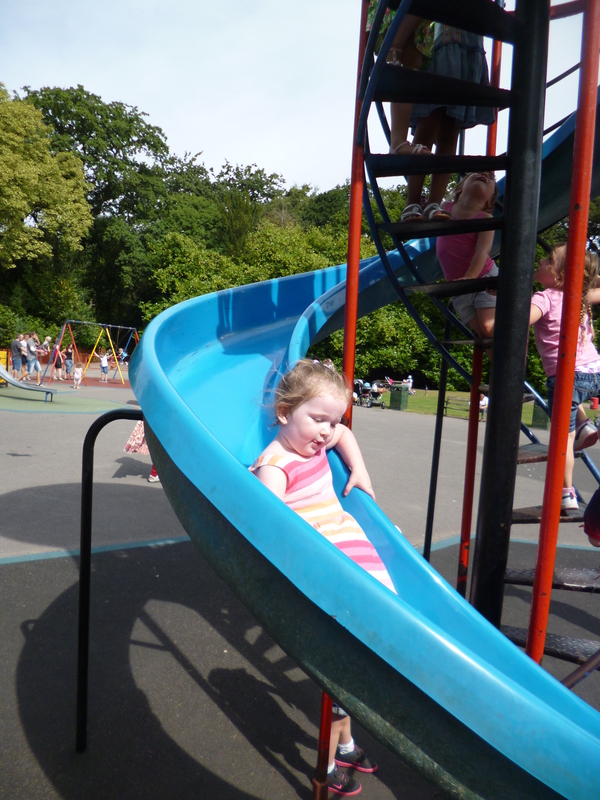 They all loved the playground – Eve went straight for the huge Helter Skelter Slide; Lilly’s favourite thing was climbing to the top of one of those spider web net climbing frame things. A slightly hair-raising moment when Lilly was right at the top of the frame – and Eve was as far away as she could possibly be on the other side of the playground – a time when I really needed to be in two places at once! But we survived! After that we had a nice picnic under a shady tree, followed by a wander over to see the fish, a game of hide & seek (modified after it caused war to be more of a hunt-for-an-interesting-object-game) and playing house under a weeping willow for quite a while. 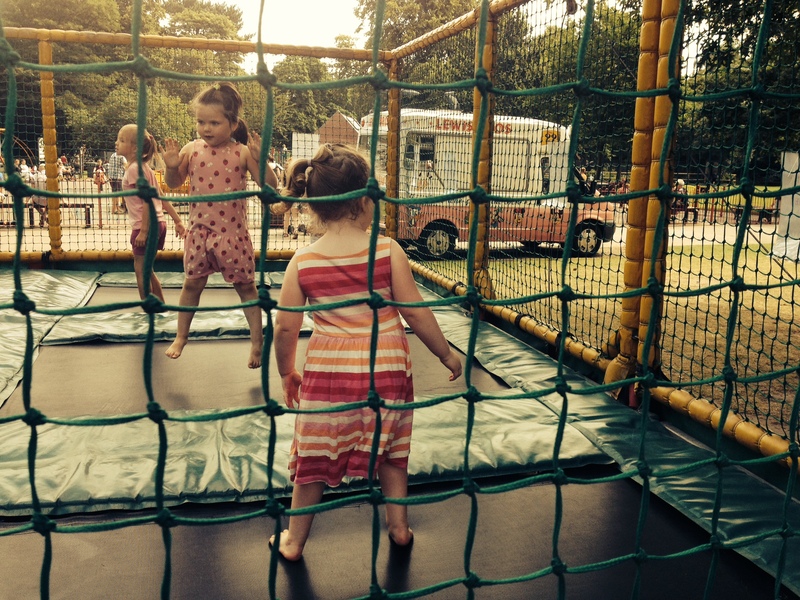 Then the girls all went on the trampolines and had great fun bouncing together! After all that fun, we relaxed with ice creams and a look around the farm. Eve was particularly interested in all the animals – she especially loved the pig which had its snout pressed right up against the fence oinking at her! We had a great day and spent about four hours there in all. But that night I was absolutely shattered! 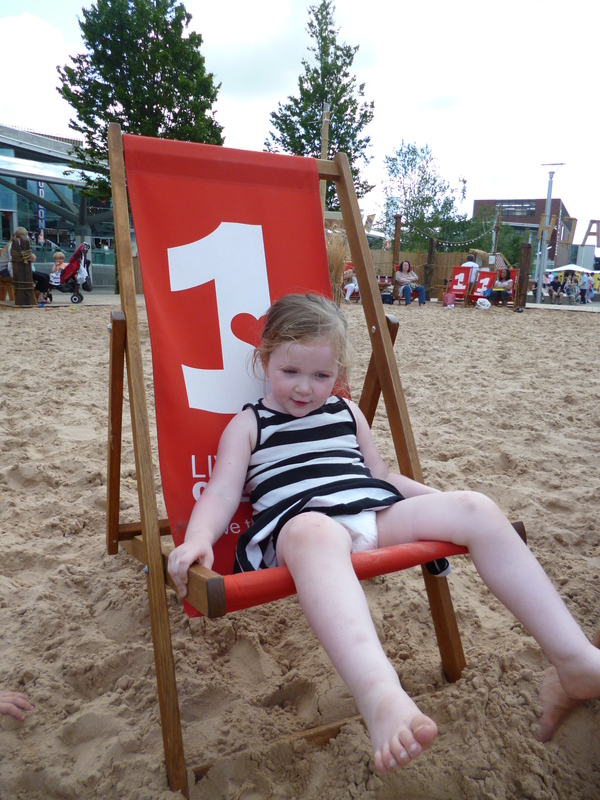 On Monday we met my mum in Liverpool and took the girls to The Beach at Liverpool One. 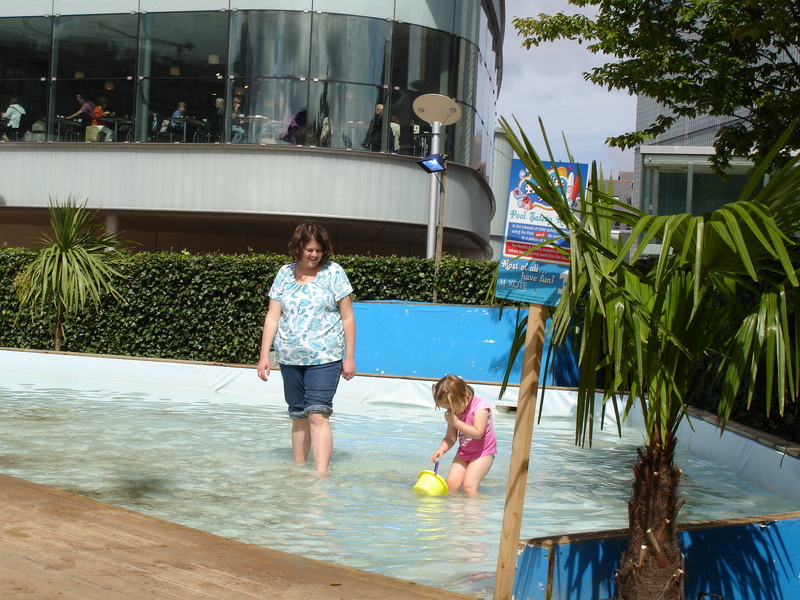 We’ve taken them there for a few years now – it’s basically an artificial beach in the centre of a shopping centre. A bit disappointing this year as they’ve taken the ‘sea’ away from the beach for “health and safety” reasons, which basically means it’s just sand. 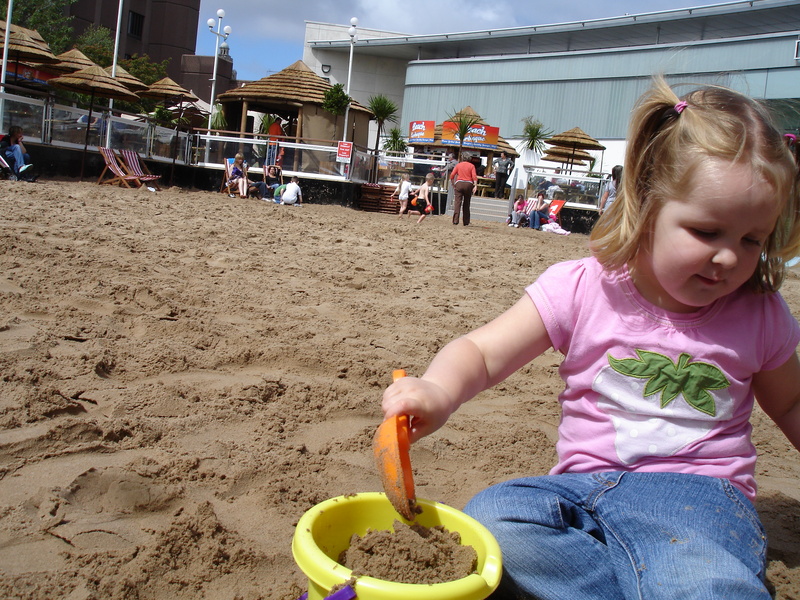 But it’s still lovely and the girls had a fantastic time making sandcastles and playing. 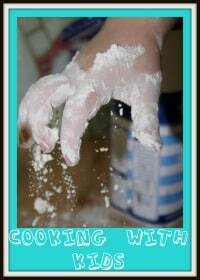 It was a great reminder though of what a pain sand is! And getting three kids to eat sandwiches at the beach without getting sand in them is basically impossible! It was really interesting to see the three personalities at work. Lilly went into creative artist mode and got very serious about making a dog sand sculpture. When they had beach games for the children, she didn’t want to join in because she was too busy with her creation! She didn’t even want to stop for lunch (but she did!). Isla really enjoyed playing with Eve and making sandcastles with me, but kept herself to herself and didn’t try to make friends with the other children. 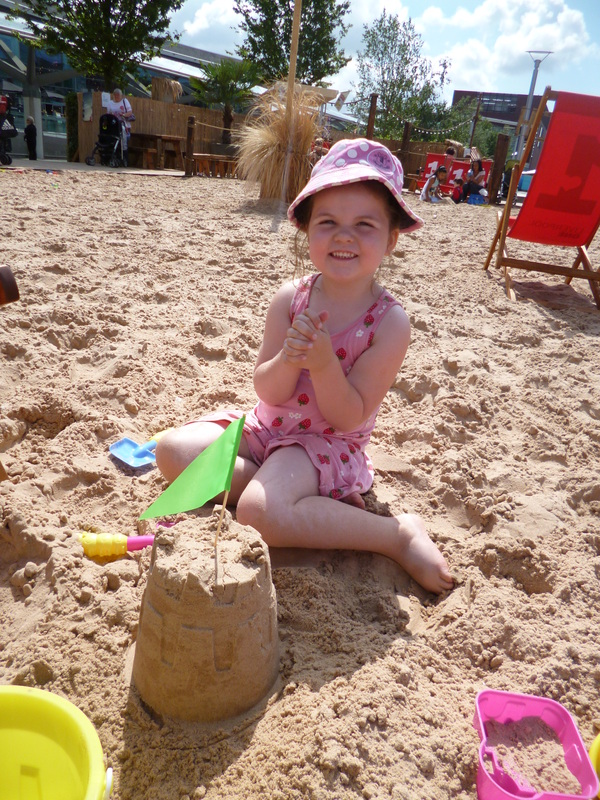 Eve had the time of her life exploring a tunnel through the giant sandcastle on the beach with the other children, and was happy to go up to other groups of children and start joining in with their games! At one stage I saw her go up to a girl of about 10 who was holding the hand of a little baby (probably her baby brother). Eve walked up to the other side of her and put out her hand, telling the girl: “hold my hand too”! 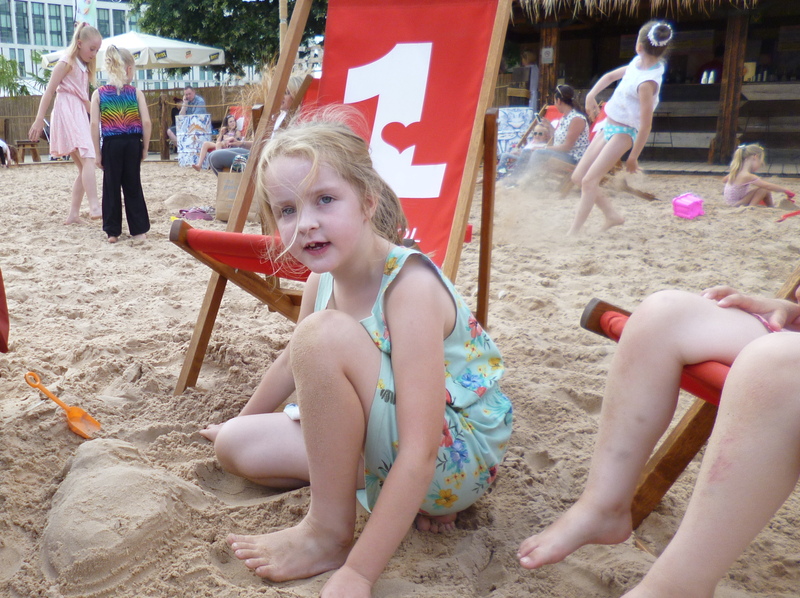 And when they started the beach games, Eve was first up! 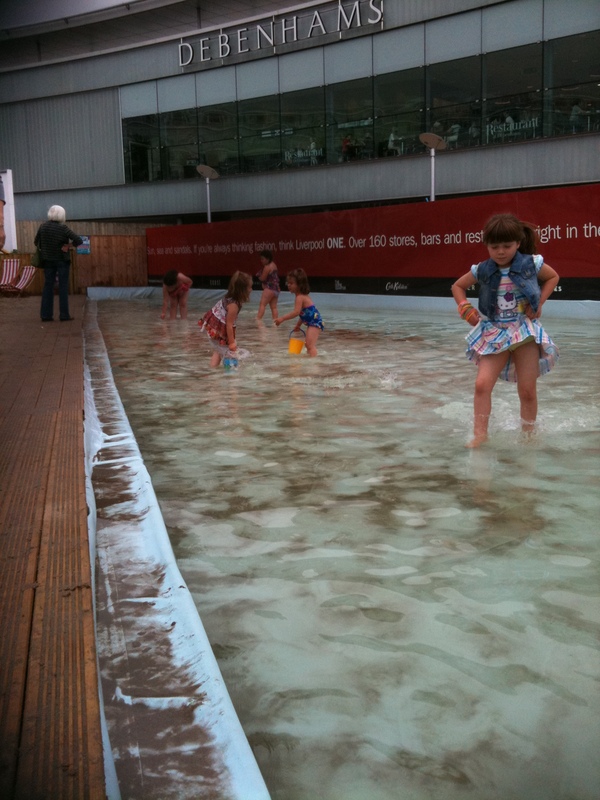 And on the last day before I went back to work, I took the girls swimming with Nanna. They’ve been asking to go for ages, and they loved it. Amazingly, Eve wasn’t so sure at first and just wanted to sit on the edge splashing her feet. But by the time we left she was quite happy to be in the water playing games and pretending to swim! 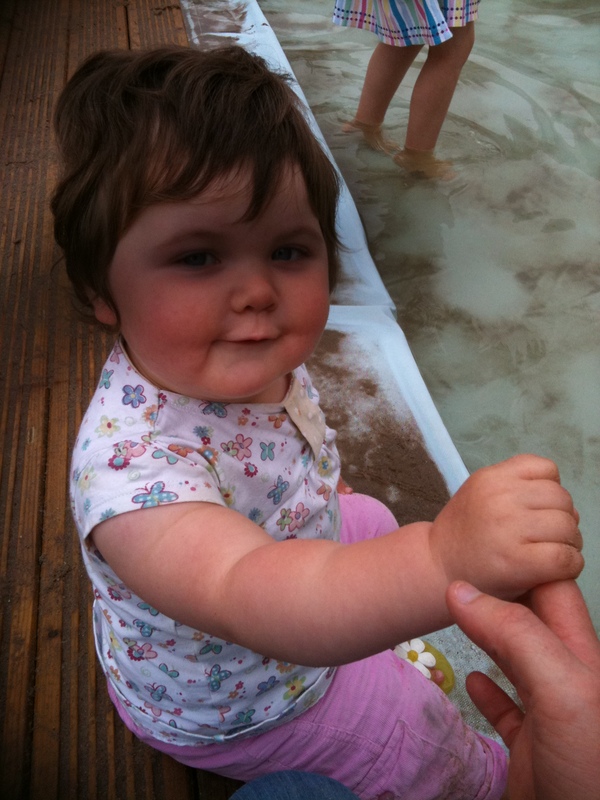 Lilly was happy just doing her own thing – she really believes she can swim now and insisted in trying without her arms bands – which was when she found out what arm bands are actually for! And Isla was happy ‘learning to swim’ and playing silly games with me up and down the pool. All in all a great three days, now I’m looking forward to my next two days off work next week… just need to come up with exciting plans to keep up the momentum!